The Morgenster vertical tasting apparently clashed with another tasting in Hong Kong (but then most tastings do!). Luckily I was not invited to the other one so was very happy and definitely did not regret being able to concentrate on this French-at-heart South African wine. Located only about 4km from the Atlantic Ocean in Somerset West just south of Stellenbosch, the vineyard benefits from the cool sea breeze resulting in a growing season 2º-3ºC lower than inland. Hence the wines are a touch lower in final alcohol and higher in acidity. Being closer to the ocean also implies more vintage variation, and it does show in the wines we tasted. 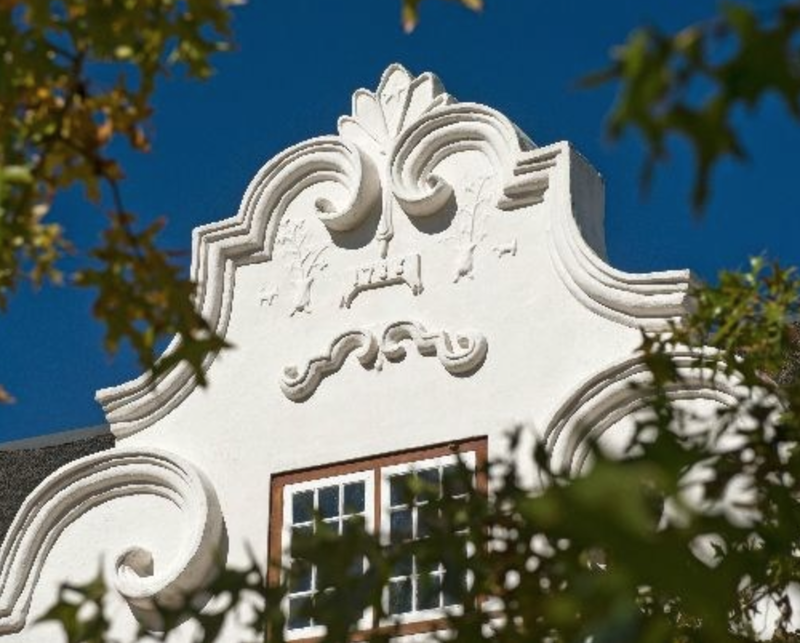 The owner, Italian Giulio Bertrand, fell in love with South Africa and especially the setting of Morgenster—meaning ‘morning star’ in Dutch—with its Cape Dutch manor house dating back to 1786. He decided to retire there and make the best Bordeaux outside Bordeaux and the best olive oil outside Italy. Being from the textile industry which has nothing to do with winemaking and olive oil production, he engaged professional help to realise his dream. Pierre Lurton from Cheval Blanc is the man responsible for his wine. There are two things that differentiate Morgenster from other South African wineries in the same league. First. Giulio and Pierre have the vision to retain a portion of each year’s production to age in cellar, so there are always at least ten backdated vintages available for sale and customers can appreciate the older wines in perfect condition—not every winery has the luxury to do this because of cash flow. Secondly, while Pierre goes to Morgenster every April for the vintage, it is Henry Kotze, the winemaker, who takes the wine to Cheval Blanc every October to make the blend. I don’t think too many wineries in the world, let alone South Africa, adopt such a practice. So it can be argued that Morgenster wine is truly a French-at-heart South African wine. There are two labels available, both Bordeaux blends: Lourens River Valley and the flagship Morgenster which is only made in the best years. We tasted four of each: 2009, 2005, 2003 and 2001. Both 2005s have more weight and sweet ripe fruit characters because it was a hotter year. We were split between the 2003s and the 2001s, both cooler years, which are more ready to drink now. For the Laurens River Valley my preference was the 2001 as the wine revealed different aromas and bouquet every time I took a sip. The 2009, from another cooler year, is definitely still too young but it has the backbone to develop like the 2001. As for the Morgenster, my favourite was the 2003 with finesse yet a firm structure. Anyway, the point here is not to reach a consensus on which wine or vintage is the best. They are all of high quality and each has its own style so we just have to follow our individual preference. James Yates proudly said that he is a Merlot fan and so loves the Morgenster 2005 which has 86% Merlot in the blend! So don’t blindly take the wine critics’ word; try them for yourself. Morgenster and Laurens River Valley are available from Victoria Wines. Gosh, she must be one of the most elegant lady winemakers I have met! Ayana Misawa, from the fifth generation at Grace Wine in Yamanashi Prefecture, about 100km from Tokyo and north of Mt Fuji, was in town recently to present her wine. Trained in Japan, Bordeaux and Stellenbosch, and having worked in Argentina, Chile, Australia and France, young Ayana (I reckon she is only in her early 30s) is now the chief winemaker at Grace Wine. However, being one of the very few female winemakers in male dominated Japan, it is not easy. Ayana is determined, certainly confident yet sensitive. 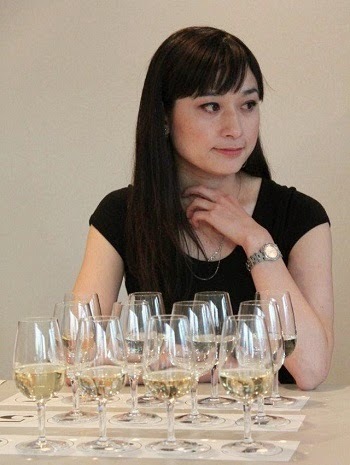 I was discussing with someone about the feminine side of wine lately and Ayana is definitely a representative, and probably an inspiration to a lot of like-minded Asian women. Her spirit is reflected in the wines. They are refined and delicate, yet have character. The Cuveé Misawa Rouge, a blend of 65% Cabernet Sauvignon and 35% Merlot sadly not available in Hong Kong (yet), is the combination of New World fruitiness and Old World restraint minus the high tannin, definitely worth the ￥6,000 per bottle (about HK$500-600 if available here). Koshu (甲州), an indigenous grape in Japan, is as delicate as the lady herself. Ayana’s father was the pioneer in replacing the pergola trained Koshu with vertical shoot positioning (VSP), resulting in lower yield and much more concentrated fruit. I was surprised to learn that summer temperatures can be as high as 35ºC in Yamanashi, yet Koshu only has about 11-12% alcohol thanks to its naturally low sugar level. Ayana further improves it by fermenting it in stainless steel tanks or old barrels and without lees ageing to make a refreshing vibrant wine. My first impression of Koshu was that it was vaguely reminiscent of Mosel Riesling but Ayana is more right to compare it with Hunter Valley Semillon. Koshu, with its delicate palate, certainly pairs well with Japanese sashimi. Ayana reckons it would also be a perfect match with Cantonese cuisine. I can see myself enjoying it with poached prawns, steamed bean curd and light stir-fried dishes. 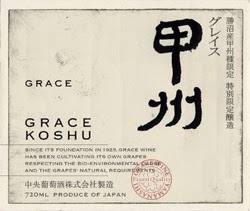 We tried two Koshus: Grace Gris de Koshu and Grace Koshu. The latter, with a slightly fuller body, is clearly my favourite. Grace also has a very well-made barrel fermented Chardonnay and a fruity Kayagatake Rouge (a blend of Muscat Bailey-A, Cabernet Sauvignon and Merlot). And if you have a sweet tooth, don’t forget its surprisingly fresh Kerner Late Harvest! By the way, Ayana confirmed that in Japan they do indeed have an individual umbrella over each bunch of grapes to shelter it from rain, and which is closed when the sun comes out. Jees, this can only happen in Japan! And thanks Gonpachi for the lovely lunch. Grace Wine is available from Northeast.